Day 1: Transfer by train from the border, airport or any other destination in Switzerland to Zermatt. Short walk to your hotel and check in, time to explore Zermatt. Zermatt lies at the foot of the Matterhorn. The town‘s touristic development is closely linked to what is most probably the world‘s most famous mountain. The resort is a car-free zone, has preserved its original character and offers nearly unlimited possibilities as far as excursions are concerned. Overnight in Zermatt. Day 2: A fascinating rail journey with the slowest express train in the world. It is a spectacular alternative to a flight over the Alps. You cross several bridges and go through many tunnels while traversing the Alps. Through the impressive Rhine gorge, over the Oberalp pass (2,033m/6,670ft) and along the deep valley of the Rhône, the Glacier Express travels through an incredibly fascinating and impressing part of the Alps. Short walk from St. Moritz railway station to your hotel and overnight in St. Moritz. 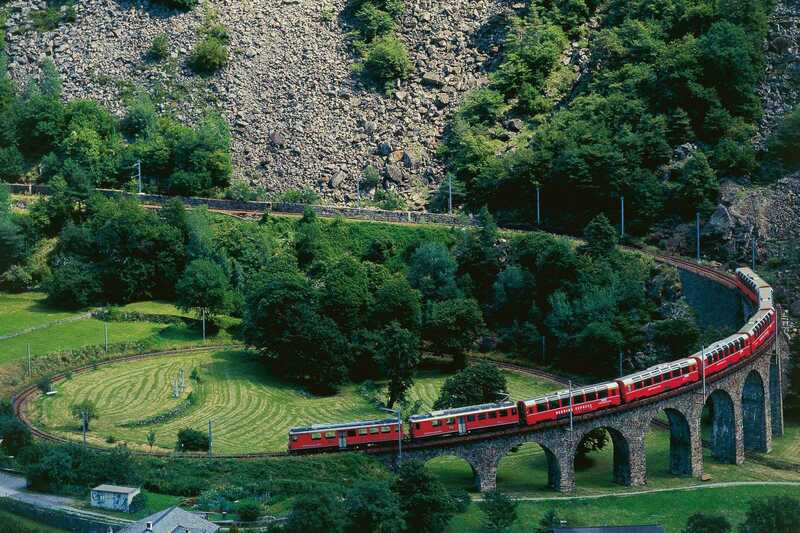 Day 3: The Bernina Express runs along adventurous and historical trails. No wonder the UNESCO rated this legendary railway as a World Heritage Site. The spectacular stretch of railway line in combination with the pristine mountain landscape of Switzerland has harmonized with the surrounding nature and technology for more than 100 years. The train starts in Overnight in Lugano. Day 4: After a healthy breakfast you can enjoy some more free time in Lugano before you depart back home. Lugano, the largest town in the holiday region of Ticino, is not only Switzerland‘s third most important financial centre and a conference, banking and business centre, but also a town of parks and flowers, villas and sacred buildings. With Mediterranean flair, Lugano offers all the advantages of a world-class city, combined with the cachet of a small town.